Some water with your order Madam: Still, sparkling or coconut? The Vita Coco brand has become synonymous with coconut water. They have really hit the jackpot by popularising a drink, that was not previously well-known in many western FMCG markets, certainly not in the UK. It seems you can’t really go wrong with coconut water; it’s low in fat, healthier than many soft drinks and a natural product with high mineral and electrolyte content. This has enabled Vita Coco to market their drink from several angles and through a few supply chains. It’s not much of a surprise that it can be found in virtually all organic and health food stores, nestled among its increasing number of competitors. Somewhat more impressive, is its appearance in supermarkets, corner shops and newsagents all over the country and now gyms and health clubs. Not only is Vita Coco being sold as a healthier alternative to run-of-the-mill soft drinks, it is also sold as a sports drink. The tagline “hydrate naturally, from a tree not a lab” is no doubt in reference to the burgeoning ‘scientific’ sports drinks market, led by Lucozade and Powerade. Vita Coco continued this approach with the introduction of a 500ml sports-cap version, launched late last year.This two-pronged attack is pretty clever and gives them access to a huge number of retailers. In fact, Vita Coco are on their way to creating a new product category, pretty much on their ownsies. Most people would not have considered coconut water a desirable product, or even known about its existence without Vita Coco. Combined with their high-profile marketing campaign, headed by Rihannna, and their brand has become highly desirable. Aside from the obvious benefits of endorsement by an A-lister, Rihanna fits, in fact, she enhances the product image. 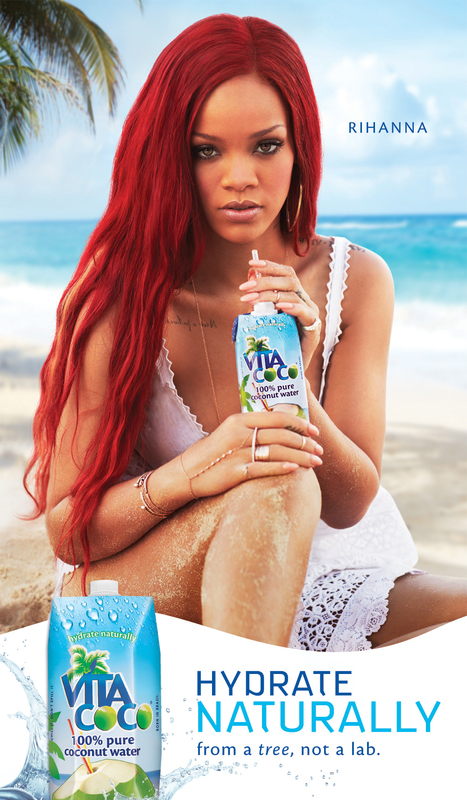 It doesn’t really matter what she is in the headlines for, her music has always been strongly connected with her sunny Caribbean roots and it is this image which Vita Coco have been clever to cultivate. Two years on from the Vita Coco UK launch in 2010 (the product launched much earlier in the US, back in 2004) and multiple rival brands have appeared on the shelves. Chi, Go Coco and Zico are some of the most accessible brands. Inevitably, there has been a media backlash against the fast-growing category, and many consumers are now seeking out what may be better quality products, or those without such a price premium. One such brand is Agua d’Coco, from Brazil, where they have been quaffing coconut water probably for as long as they’ve had coconuts. There’s no doubt Vita Coco’s marketing strategy has been impressive, and with so many rival products appearing it looks as if they have now reached their goal of emulating what “Red Bull did for energy drinks and Innocent did for smoothies.” However, if you’re now addicted to coconut water but think Vita Coco is a little too pricey, you can find Agua d’Coco and similar imports in large supermarkets, about 20% cheaper and possibly better tasting too. Previous Post Previous post:The Gentrification of Popcorn: the Notting Hill of the Snack World.